"I couldn't believe it! We were going to make a record on the same label as my then-idols Cliff and The Shadows"
This group was very well-known as one of the top local bands during the early 1960s. They are significant in rock music history as the line-up was to include two of the most famous Birmingham musicians of the 1960's and 70's, namely Roy Wood and Jeff Lynne. The origins of Birmingham's 'Nightriders' can be traced back to the late 1950s. A local line-up called "Johnny Star and The Planets" developed into "Billy King and The Nightriders" fronted by vocalist Billy Wakeman (King). Other group members at the time included guitarists Alan Poyner along with bass guitarist Tom Bridgman. Tom Bridgman remembers; "The band was formed at Billy Wakemans house. There was Billy, a drummer and Tony (surname forgotten). The name 'Nightriders' was decided and accepted and so 'Billy King and The Nightriders' was born. Billy was about six foot tall with jet black hair - mean & moody looking and the girls loved him!" By 1958, Billy King and The Nightriders were playing at the 'Alcobana' in Birmingham which was similar to 'The Cave' in Liverpool. They won a mainstream competition at the "Carol Levis Discoveries Show" and as a result played on the Saturday night at the Birmingham Hippodrome with the star attraction being "Cliff Richard and The Drifters" (later to become The Shadows). In 1959, the band almost disbanded as three of the members were called up for National Service. Born on September 23, 1940, Mike Tyler who grew up in Camp Hill, started his music career at a young age by singing and playing piano at a pub in Kings Heath. After entering and winning a local talent contest, he was asked to join "Billy King and the Nightriders" which he did after changing his stage name to "Sheridan". The group soon attracted a large local following and after various personnel changes, Mike Sheridan became their lead singer and frontman. The Nightriders line up was now stabilized with rhythm guitarist Dave Pritchard from a group called "The Planets" along with drummer Roger Spencer who was from Castle Bromwich and had previously played drums in a band called "The Hound Dogs". Bass guitarist at the time was Brian Cope. The final addition to the line-up was lead guitarist Alan "Big Al" Johnson (who was a manager at Burton's tailors on Corporation Street). Mike Sheridan and The Nightriders soon established a reputation around Birmingham as one of the most accomplished bands on the scene at that time. By the summer of 1963, the famous "Mersey Sound" as popularised by The Beatles was sweeping Britain, thus causing the record companies to search beyond Liverpool for similar sounding bands. In June of that year, Cliff Richard and The Shadows producer Norrie Paramor came up to Birmingham to audition local beat groups at the Moat House Club in the Bull Ring. Of the 13 bands that had been recommended, five including The Nightriders were signed-up by Paramor to the Columbia Records label. Mike Sheridan recalled; "I couldn't believe it! We were going to make a record on the same label as my then-idols 'Cliff Richard and The Shadows'. We were sent a test recording of a song called 'Tell Me Watcha Gonna Do' which we rehearsed but we still needed a B-side. So, I began my song-writing bit and wrote a 12-bar thing called 'No Other Guy'. Both these songs now make me cringe, but at the time it didn't seem to matter. We had a three-hour session at Abbey Road Studio 2, the very same place as Cliff, The Beatles, The Hollies etc. We were bewildered and totally naive but I'll always remember the 'buzz' I got when our record was released and in the shops." Mike Sheridan and The Nightriders first record release was 'Tell Me What You're Gonna Do' and was unfortunately a flop. In late 1963, Brian Cope left the group and was replaced by Greg Masters from Nechells who had played in The Dominators, The G Men, and most recently Roy Everett and The Climbers. The next single to be recorded by the Nightriders at the famous Abbey Road Studios in London was their cover of a Motown classic 'Please Mister Postman' (recorded on 22nd November 1963 - the same day President Kennedy was murdered) and although it didn't chart, it sold well locally and gained the band much attention. The Nightriders respected lead guitar player, Big Al Johnson, left the band in 1964 after appointing a young successor by the name of Roy Wood. Roy Wood was born in Birmingham on November 8, 1947. He started playing drums and harmonica at an early age, turning to the guitar when he was about 14 after being influenced by instrumental groups such as The Shadows and The Ventures. Six months later he had joined his first band called 'The Falcons' and was playing Chuck Berry and Little Richard style rock 'n' roll. Roy was the proud owner of a much coveted American Fender Stratocaster electric guitar which he played through an equally coveted "Binson Echo" box to obtain the authentic sound Hank Marvin had popularised on records by The Shadows. By 1963, Roy Wood had joined Gerry Levene and The Avengers, and had started to experiment with song writing. The Avengers also included future Moody Blues drummer Graeme Edge. 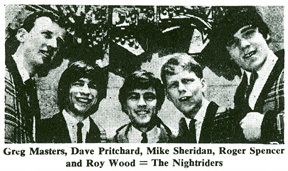 Roy Wood's association with The Avengers lasted only for about four months before he left to join Mike Sheridan's Nightriders. He answered an advertisement in the Birmingham Post & Mail that read WANTED... LEAD GUITARIST TO JOIN PRO. GROUP. MUST HAVE FENDER GUITAR, VOX AMP AND BINSON ECHO. By that time, The Nightriders were one of Birmingham's top local bands. Roy Wood was chosen out of about a dozen applicants and his talent as a guitarist and singer became immediately noticable. He went on to introducing comedy into the Nightriders act on stage by doing Donovan and Dusty Springfield impressions while wearing a suitable wig! "Roy changed the group by getting us into harmonies and made us realize there was better material around with more than three chords to play"
Mike Sheridan said; "Roy was and still is, in my opinion, an unbelievable talent. As stubborn as a mule and a complete extrovert. Roy changed the group by getting us into harmonies and made us realize there was better material around with more than three chords to play. This was our turning point and we became a group's group and a bigger name." The first Nightriders single to be recorded with Roy Wood on guitar and backing vocal was 'What A Sweet Thing That Was/Fabulous' released at the end of 1964. 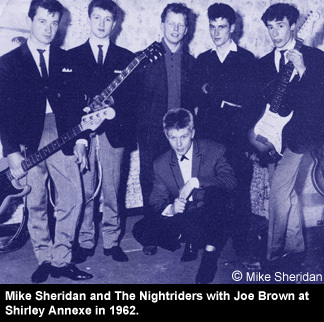 In early 1965, Mike Sheridan and The Nightriders, like many British groups in the early 1960's went over to Germany to undertake some bookings. 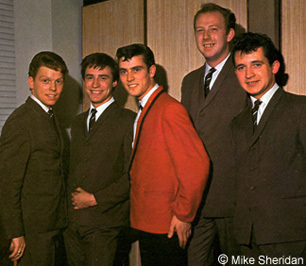 When they returned, another single 'Here I Stand/Lonely Weekends' was issued in 1965, while the group's name was changed to become "Mike Sheridan's Lot". On the next Nightriders single titled 'Take My Hand', Roy Wood alternated on lead vocal with Mike Sheridan. 'Make Them Understand' was the B-side and is significant being Roy Wood's first songwriting effort to be published. Although not an exceptional composition, it does feature some excellent guitar work but Mike Sheridan, not Roy Wood sang the vocal on it. After the release and subsequent failure of the excellent 'Don't Turn Your Back On Me' single in early 1966 (a song written by American composer Jackie De Shannon and recorded with future Pink Floyd producer Norman Smith), Roy Wood left the band to become a founding member of Birmingham's hit group The Move (see The Move). Roy's place was taken by Johnny Mann from Carl Wayne and The Vikings. Mike Sheridan carried on for a short time before also leaving. Mike said; "We'd played almost everywhere in England - supporting The Beatles, The Who, The Small Faces, Van Morrison's Them, Dave Dee etc, you name 'em. We'd come full-circle. Times were changing and Roy was the first to see the light. For me, Roy's departure signalled the end." With Mike Sheridan's departure, the group's name was shortened to "The Nightriders" although Johnny Mann decided to leave soon after and a young guitarist named Jeff Lynne who lived in Shard End, joined the band in response to an advertisement in the Birmingham Mail newspaper. The ad read; "Keen lead guitarist required for The Nightriders." Lynne's first group was called The Andicaps and he had previously been a member of The Chads (formerly known as The Sundowners). Jeff Lynne remembered the first time he rehearsed with The Nightriders was at Roger Spencer's house in the front room. "I played played Wilson Pickett's 'Midnight Hour' and it was the first song I sang lead vocal on". The first Nightriders single recorded with Jeff Lynne was titled 'It's Only The Dog' but it was drummer Roger Spencer who sung lead on it. After the release of this final Nightriders record on the Polydor label at the end of 1966, the band was re-named "The Idle Race" in response to changing trends. Now led by Jeff Lynne, a change in musical direction followed that would see the group re-born as a major creative force (see Idle Race). Mike Sheridan continued to perform around the Midlands for a while as "Mike Sheridan's New Lot" with a line-up consisting of Joe Dignam on drums, guitarists Pete Oliver and Terry Wallace (see Carl Wayne and The Vikings) and Colin Timmins on bass guitar. They recorded a single prophetically titled 'I Can't Get Used To Losing You' issued in 1966 on Columbia Records. Mike Sheridan later joined up with Move bass guitarist Rick Price to form the group "Sheridan-Price" with whom he also recorded an album (see Sight and Sound). 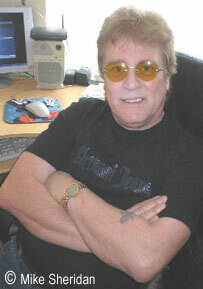 Mike also made some solo records during the 1970s under the name "Elmer Goodbody Jnr". Mike Sheridan had a break from music in the 1970s to start a successful business as a potato merchant. In the 1980s, Mike returned with a new 'Nightriders' band playing 1960s style music. He's still a well-known and much respected performer in the Birmingham area along with his wife Suzi Sheridan with whom he has formed a singing duo. Another "Nightriders" line-up was still active recently and included Rod Godwin who has worked with Jimmy Powell, Cathedral and Coventry band Jigsaw as well as many others including Badfinger. The band also features veteran musicians Phil Middleton and Nick Cripps. As one of the original founding fathers of the Brum Beat scene and with a career in music spanning 50-plus years, Mike Sheridan has seen it all. Still going strong today as one half of a performing duo alongside his wife Suzie, Mike Sheridan recently launched his very own web site that he hopes will help clear up much of the mis-information that has been written about him over the years. "I was so fed up of reading all of the other (web sites), some of which were completely wrong, so I thought I'd put it right" says Mike. 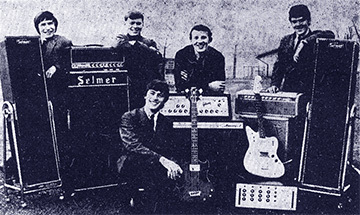 For those who don't know, Mike Sheridan fronted the legendary Brum band The Nightriders who along with Carl Wayne's Vikings and the Spencer Davis Group, were one of the top-rated performing bands in the West Midlands during the first half of the 1960s. The various respected guitarists in The Nightriders over the years included Roy Wood and Jeff Lynne - both to find fame in the hit groups The Move and Electric Light Orchestra (E.L.O.) respectively. Though not to reach the charts himself, Mike Sheridan was very much involved in the developing Birmingham music scene and has a long list of recordings to his credit. He even appeared on Top Of The Pops as a member of Roy Wood's chart-topping band Wizzard! You can now visit Mike Sheridan's very informative web site at www.mikesheridan.org.uk 'The Official Mike Sheridan Website' that details his career starting at his musical roots in Brum and up to the present day. Also included is latest information on where you can catch Mike on-stage still performing the great rock 'n' roll classics that inspired himself and so many others.